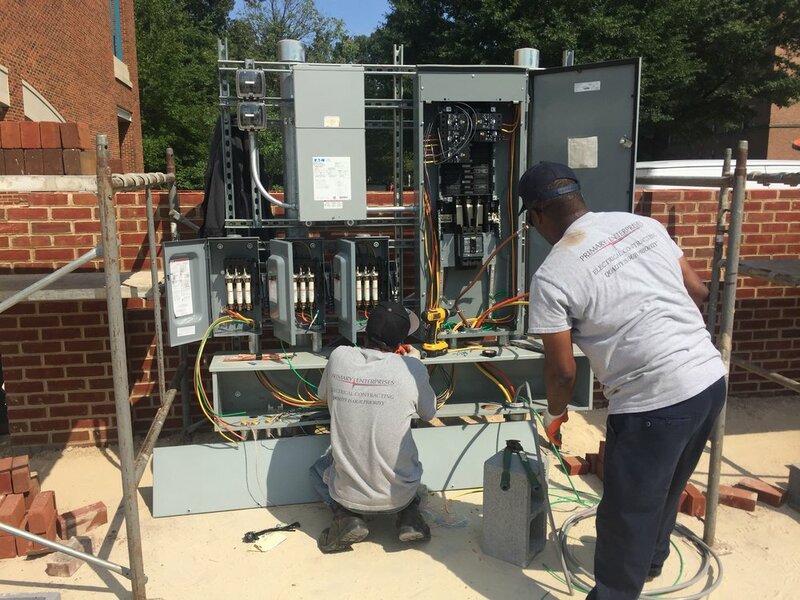 With offices in Maryland and Washington, DC, Primary Enterprises is a family-owned, licensed, and insured electrical contracting firm founded in 2003 by Andre McCauley, a master electrician (licensed in MD and DC) with over 30 years of experience. Primary Enterprises, LLC is a family-owned, licensed, and insured electrical contracting firm certified by the State of Maryland. We have specialized in government, commercial, industrial electrical construction, and service work since 2003. We are an electrical contractor that is fully committed to giving our diverse clientele prompt, consistently top quality electrical work designed to meet and exceed industry standards for safety and efficiency, regardless of the size or scale of the electrical work you need to be done. Our personable team of fully licensed and insured in-house electricians are leading experts in commercial and industrial electrical applications. Drawing on a wealth of experience and training in electrical work of all kinds, we are optimally positioned to give our clientele a complete electrical service. With our time-honored commitment to client care, we act quickly to put your mind at ease and give you electrical services that are completely adapted to meet your specific needs. We will work closely with you to give you a range of proven effective, up-to-date solutions to your home or business' electrical requirements. And at Primary Enterprises, LLC we never cut corners in our endeavor to give you the very best and fully code-compliant electrical work possible. Our team has built a strong reputation for timely, safe and reliable electrical solutions. Our electricians are handpicked for their attention to detail, versatility, and ability to work in a wide variety of contexts. We combine experience and expertise in a wide range of commercial and industrial electrical applications into an electrical service designed to maintain the highest safety standards and optimize your business' electrical performance. RSC Electrical & Mechanical, Inc.
We are always looking to add high-energy talent to our team! Primary Enterprises is the leading provider of comprehensive electrical solutions for commercial and government clients, Find out how Primary Enterprises can help deliver your next project.